Friday is finally here and I am ready for a relaxing, cigar filled weekend. But unlike any other weekend, I will be taking time to reflect on the ultimate sacrifice made by so many brave men and women to protect the freedoms we enjoy here in the United States of America. Light one up for those who paid the ultimate price this Memorial Day. Big changes are in the works at Drew Estate Tobacco Company. Two weeks ago, an announcement was made of Nick Melillo’s departure from Drew Estate . Nick was responsible for tobacco purchasing, as well as blending. One week later, Willy Herrera was named Master Blender of the company. Since joining the DE team in 2011,Willy has only released one blend to-date, the Herrera Esteli. 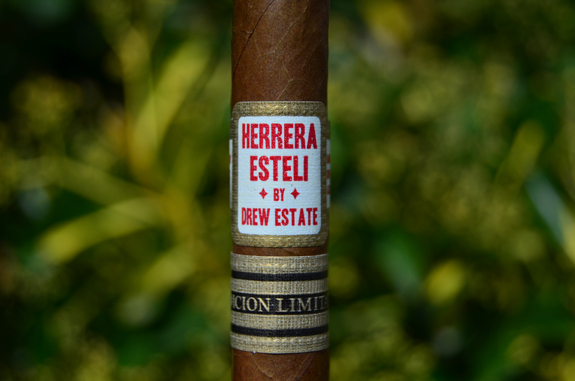 In December of 2013 news broke that a limited edition cigar was being released under the Herrera Esteli line in early 2014. 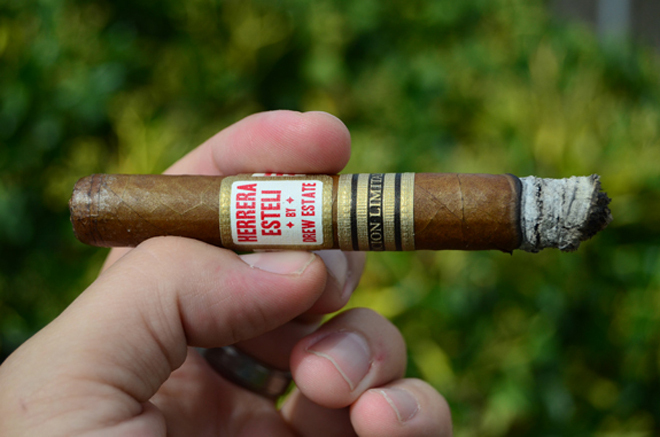 After a few set backs, the Herrera Esteli Lancero – Edicion Limitada 2014 has finally arrived. And it has arrived with a bang. 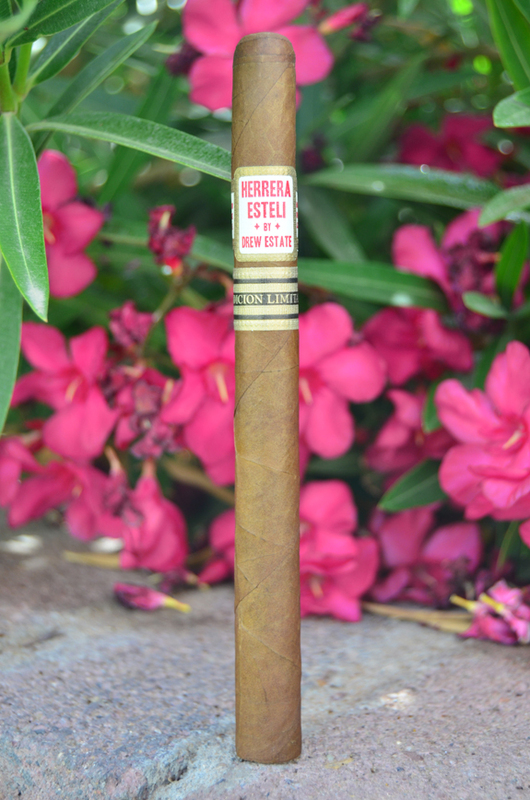 This limited edition Herrera Esteli comes in a 7 1/2 by 38 lancero and produced at Drew Estate in Esteli, Nicaragua. One of my favorite sizes. Regular production vitolas of the Herrera Esteli include: Short Corona (5 1/4 by 46), Robusto Extra (5 1/2 by 52), Lonsdale (6 by 44), Piramide Fino (6 by 52), and Toro Especial (6 1/4 by 54). 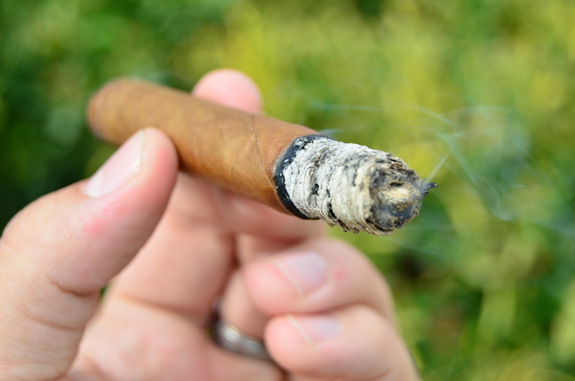 Everything about this cigar screams class – the look, the size, and both bands. 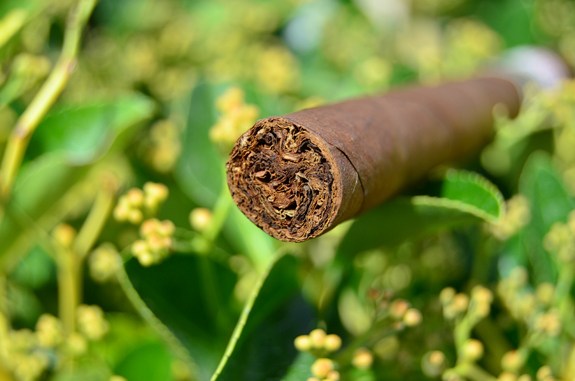 The wrapper leaf is light brown in color. The seams are easily seen against the light colored leaf. A couple of green color imperfections are spotted. As I check for soft spots, the wrapper leaf feels delicate under my fingers. I absolutely love the smell of the wrapper with its notes of warm, rich cedar and tobacco. It is the smell you get going into a walk in humidor. The foot has distinct notes of barnyard, along with cedar. Upon removing a small piece of the triple cap with my double guillotine cutter, rich notes of clove and cocoa present themselves on the cold draw. The peppery spice is impressive right off the bat, warming my mouth and leaving a tingle in the back of the throat. As the cigar burns down through the first ¾ inch, some faint sweetness begins to show through. The cedar is also much more noticeable as the pepper has backed off a bit. The smoke texture is somewhat chewy. 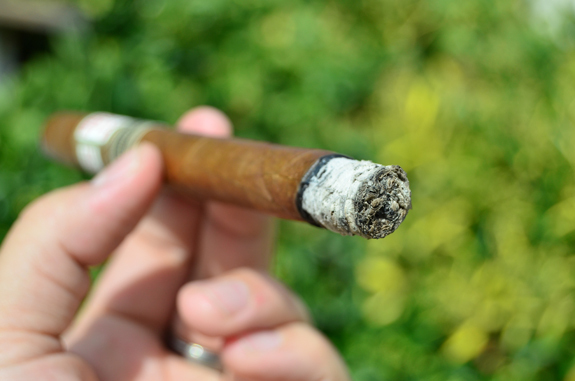 After knocking the first ash off, the cigar is beginning to cone letting me know to slow it down. I forgot how fast a lancero can burn at my regular smoking rate. The ash is white and the burn is even. The flavors are definitely full and I am already feeling some nicotine. I do not recall feeling any nicotine, especially so early on, in the other vitolas. As I pull into the second third of this limited edition cigar, the smoke is creamy and the cedar and faint sweetness are still pulling through in the profile. The pepper is balancing nicely, but, if you are a spice fan, the retrohale continues to showoff the spice. 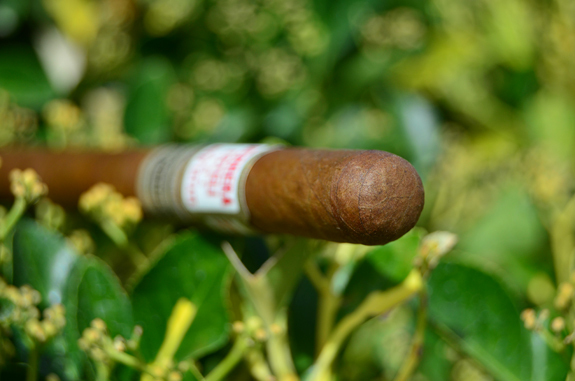 A unique acidic quality, somewhat floral, somewhat perfume-like, is adding to the complexity of the Hererra Esteli Lancero . A small crack in the wrapper has formed right on the seam. It look like I’ll be able to burn past it with no issue. Sure enough, I was able to burn past the crack. The cigar was and is still performing beautifully. The draw is perfect, the smoke production is awesome, and flavors are full and engaging. The flavors have not developed much from the middle third except for some earth or leather notes that have joined the mix. Burning down to the final inch, the smoke remains mostly cool and the flavors pleasant. 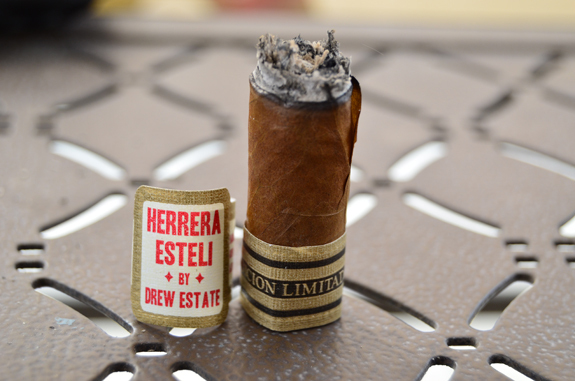 Willy Herrera far exceeded my expectation with the Herrera Esteli Lancero – Edicion Limitada 2014. This small ring gauge brought more body, fuller flavors, and a good amount of strength to the table. From start to finish, this stick was an absolute treat. A classic smoke well worth the $12 price tag. I look forward to the direction Willy Herrera will take Drew Estate Tobacco Company in regards to the expansion of their traditional lines. I am also excited to see where Nick Melillo will pop up in the industry. Hey, Ryan! Where the heck have you been hiding? You are absolutely going to love the lanceros! As mentioned in the review, the lancero was a bit fuller and spicier than the other vitolas. But one thing it lacked was the sweetness I picked up on in the Toro size, which is my second favorite (behind the lancero) in the HE line up. Hope you enjoy the sticks.